Disney icons in Kingdom Hearts, Spider-Man in Tony Hawk’s Pro Skater, Wii Fit Trainer in Super Smash Bros. – we love it when our highly beloved characters show up in the most surprising of video games. When it comes to wrestling video games, we’ve seen a range of surprise inclusions, both fictional and real people, show up to grapple inside the ring (more about those here), but on very rare occasions, some of our favourite pro wrestlers have decided to step away from the ring, and show their face in an unexpected virtual space. Here are Five Times Real-Life Pro Wrestlers Appeared in Non-Wrestling Video Games. Rules: It doesn’t count if a wrestler is credited as a voice actor in a game unless they are playing themselves. Also, video games that are licensed by a pro wrestling promotion do not count (e.g. WWE Crush Hour, WWE’s mobile games, etc. ), and we will not be including fictional wrestlers created for video games, for example Tekken’s King or Street Fighter’s Zangief, only those that are/were genuine pro wrestlers. The developers of the later entries of the Saints Row series did not try to hide their love for professional wrestling whatsoever in their ridiculously chaotic games. 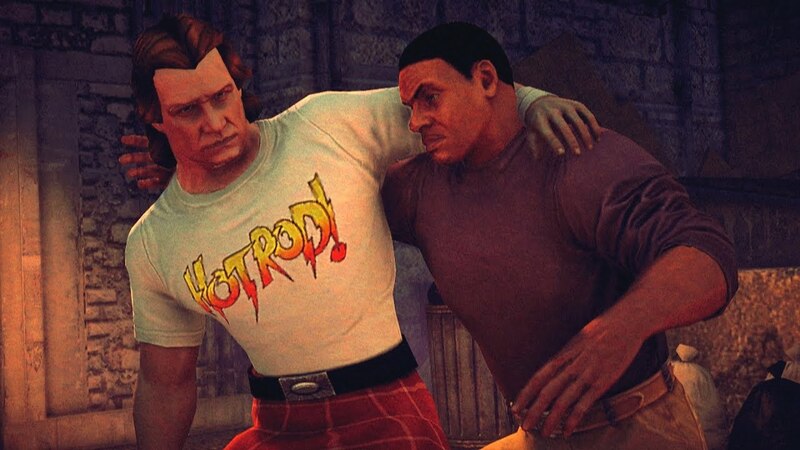 Several famous character poses from the likes of Hulk Hogan and Ric Flair were selectable in Saints Row The Third, and even pro wrestlers such as Hulk Hogan and Rob Van Dam have voice acting credits in the games. However, in Saints Row IV, Deep Silver took their homages to pro wrestling to the next level. This isn’t just a brief appearance from the former WWF Intercontinental Champion though, in fact, the entire mission is based around Piper’s iconic role in the 1988 sci-fi movie, They Live. Roddy swears a lot, Roddy hits a clothesline, dropkick, inverted atomic drop, back-breaker, uses his patented Sleeper Hold, and talks a lot about pro wrestling. Even his WWE entrance music is played during his cameo – they really went the extra mile with this one, and is bound to make any WWE fan smile as soon as they see it. Now, although none of the company’s wrestlers actually appear as playable characters in the latest Tekken game, I had to include this one just for how awesome it is. NJPW have made some surprising choices in the past in regards to video games – they once released their own pachinko game on the original Playstation called Parlor! Pro Special: CR Harenchi Gakuen & Chou-Shindai, which is essentially just a more confusing version of pinball with photos of Antonio Inoki in it. Yet in 2017, they hit us with a far greater video game surprise. In collaboration with New Japan Pro-Wrestling, Tekken 7 included multiple real-life merchandise from Chaos, Bullet Club and the company itself as wearable costumes within the game, as well as a Kazuchika Okada costume for long-running Tekken character, King, complete with it’s own Rainmaker Rage Art finishing move. In November 2017, Tekken 7 also introduced a Hiroshi Tanahashi-inspired outfit for Lars accompanied by a new Rage Art and background theme. Although the wrestlers themselves don’t make physical appearances in the games, their merchandise, signature moves and names are all included, and that’s good enough for me. What makes this crossover even more awesome is that the collaboration spawned Bullet Club x Tekken crossover merch, available to buy from ProWrestlingTees, and the game still sponsors every New Japan event to this day. Perhaps in the near future, a New Japan roster member will make it’s way into Tekken 7 as a full playable character (my vote would be for Minoru Suzuki as he could just murder everybody), but for now, dressing Heihachi in a Bullet Club tee is enough to keep me happy. 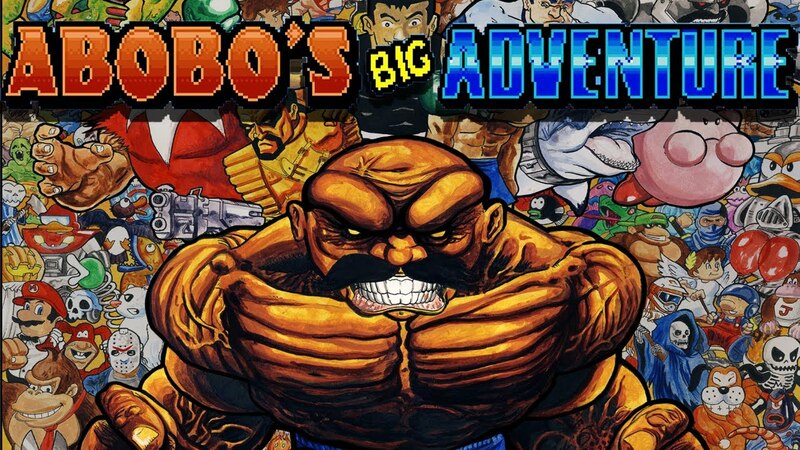 Abobo’s Big Adventure is a free-to-play flash game that pays tribute to every major NES game you can think of. Essentially, it’s a non-stop barrage of nostalgia that spans every genre possible. Although never receiving an official console release, the game is around an hour in length, has been covered by major websites such as IGN and Cinemassacre, and received wide critical acclaim upon release. Despite being most notable for it’s many references to icon Nintendo franchises, my personal favourite section is “Pro Wrabobo” which sees the game’s protagonist, Abobo (a boss from the Double Dragon series), face-off against a creature named The Amazon in a wrestling ring, with gameplay similar to Nintendo’s 1986 game, Pro Wrestling (except with SO much more blood). Once Abobo defeats his Amazonian foe, he summons four wrestling gods from the heavens in spectacular fashion. Hulk Hogan, The Undertaker, Roddy Piper and The Ultimate Warrior all descend upon the ring, each in their iconic ring gear, and individually hit their finishing moves on The Amazon. In a game that is essentially built entirely upon childhood memories, this is the sweetest nostalgia trip of them all, brother. I probably don’t need to tell you this, but Japan has produced some very, very weird video games over the years – I’m Sorry (also known as Gonbee No I’m Sorry) is one of those. This 1985 arcade game by Sega has you play as a caricature of former Japanese Prime Minister, Kakuei Tanaka, who is infamous in his homeland for being arrested and imprisoned during his time in office over bribery charges. As a direct joke towards Tanaka’s greedy, back-room dealings, the object of this political satire game is to collect as many gold bars as possible whilst navigating your way through maze-like levels. Standing in your way are various obstacles and enemies, one of which is for whatever reason (don’t try and justify anything that’s in a Japanese video game, just accept it’s there) All Japan Pro Wrestling founder and Japanese pop culture icon, Giant Baba. Perhaps an odd choice of enemy for a game about a former Prime Minister collecting gold, but considering other adversaries featured in I’m Sorry include Michael Jackson, Madonna and Carl Lewis, the 6’10 pioneer of pro wrestling doesn’t seem all too strange in comparison. Due to his famously large stature, Baba is one of the hardest enemies in the game, requiring up to ten times more strikes to defeat compared to other foes. As far as pro wrestling cameos in satirical video games about Japanese prime ministers go, this one has got to be in the top five at least. The open-world Yakuza series of games are well-known for cramming each of their main-series entries to the brim with highly entertaining combat action, along with a hell of a lot of surprising extra content, including mini games, playable classic Sega titles, various sports and activities to indulge in, singing, disco dancing, and so much more. The latest iteration of the game, which currently has only been released in Japan yet the worldwide release is a couple of months away at the time of writing, gave us some of the most surprising content the series has ever seen. Along with full, playable versions of Virtua Fighter 5: Final Showdown, Puyo Puyo, Out Run, Super Hang-On, Space Harrier, and Fantasy Zone, as well as karaoke, gym, darts, and other mini games, Yakuza 6 surprised us all by allowing us to rage war against our favourite NJPW heavyweights. New Japan Pro Wrestling stars Hiroshi Tanahashi, Hiroyoshi Tenzan, Kazuchika Okada, Satoshi Kojima, Tetsuya Naito and Toru Yano all appear in this massively diverse game as members of rival gangs. Each of the six Japanese grapplers voice their own in-game models, all of which you have to face in a series of boss battles throughout the game. Oh, and in case you’re wondering, yes, Tetsuya Naito does wear an all-white suit and does his signature tranquillo pose, and yes, Okada does hit you with The Rainmaker, and yes, you will mark out several times. As far as pro wrestler cameos in non-wrestling video games go, this has got to be number one. Six legends and future legends all appearing in one game as rival gang members that you must defeat in a series of boss battles – what else could a New Japan fan want?! And you get to sing karaoke as well, best game ever! Thankfully for us Western fans, Yazuka 6 is currently set to be released worldwide on April 17th 2018, and NJPW content for Fire Pro Wrestling World hits the Playstation this summer, so it looks like 2018 will be the year New Japan takes over not only the wrestling world, but the video game world as well. FOR MORE WRESTLING VIDEO GAME READABLES, CLICK HERE. FOR MORE NEW JAPAN ARTICLES, CLICH HERE.